The Battle of Adwa occurred on March 1, 1896, and was the decisive engagement of the first Italo-Ethiopian War (1895-1896). Seeking to expand their colonial empire in Africa, Italy invaded independent Ethiopia in 1895. Led by the governor of Eritrea, General Oreste Baratieri, Italian forces penetrated deep into Ethiopia before being compelled to fall back to defensible positions in the border region of Tigray. Entrenching at Sauria with 20,000 men, Baratieri hoped to lure Emperor Menelik II's army into attacking his position. In such a fight, the Italian army's technological superiority in rifles and artillery could be best put to use against the emperor's larger force. Advancing to Adwa with approximately 110,000 men (82,000 w/ rifles, 20,000 w/ spears, 8,000 cavalry), Menelik refused to be lured into assaulting Baratieri's lines. The two forces remained in place through February 1896, with their supply situations rapidly deteriorating. Pressured by the government in Rome to act, Baratieri called a council of war on February 29th. While Baratieri initially advocated for a withdrawal back to Asmara, his commanders universally called for an attack on the Ethiopian camp. After some waffling, Baratieri acquiesced to their request and began preparing for an assault. Unknown to the Italians, Menelik's food situation was equally dire and the emperor was considering falling back before his army began to melt away. Moving out around 2:30 AM on March 1, Baratieri's plan called for the brigades of Brigadier Generals Matteo Albertone (left), Giuseppe Arimondi (center), and Vittorio Dabormida (right) to advance to high ground overlooking Menelik's camp at Adwa. Once in place, his men would fight a defensive battle using the terrain to their advantage. The brigade of Brigadier General Giuseppe Ellena would also advance but would remain in reserve. Shortly after the Italian advance commenced, problems began to arise as inaccurate maps and extremely rough terrain led to Baratieri's troops becoming lost and disoriented. While Dabormida's men pushed forward, part of Albertone's brigade became entangled with Arimondi's men after the columns collided in the darkness. The ensuing confusion was not sorted out until around 4 a.m. Pushing on, Albertone reached what he thought was his objective, the hill of Kidane Meret. Halting, he was informed by his native guide that Kidane Meret was actually another 4.5 miles ahead. Continuing their march, Albertone's askaris (native troops) moved around 2.5 miles before encountering the Ethiopian lines. Traveling with the reserve, Baratieri began to receive reports of fighting on his left wing. To support this, he sent orders to Dabormida at 7:45 AM to swing his men to the left to support Albertone and Arimondi. For an unknown reason, Dabormida failed to comply and his command drifted to the right opening a two-mile gap in the Italian lines. Through this gap, Menelik pushed 30,000 men under Ras Makonnen. Fighting against increasingly overwhelming odds, Albertone's brigade beat back numerous Ethiopian charges, inflicting heavy casualties. Dismayed by this, Menelik contemplated retreating but was convinced by Empress Taitu and Ras Maneasha to commit his 25,000-man imperial guard to the fight. Storming forward, they were able to overwhelm Albertone's position around 8:30 AM and captured the Italian brigadier. The remnants of Albertone's brigade fell back on Arimondi's position at Mount Bellah, two miles to the rear. Closely followed by the Ethiopians, Albertone's survivors prevented their comrades from opening fire at long range and soon Arimondi's troops were closely engaged with the enemy on three sides. Watching this fight, Baratieri assumed that Dabormida was still moving to their aid. 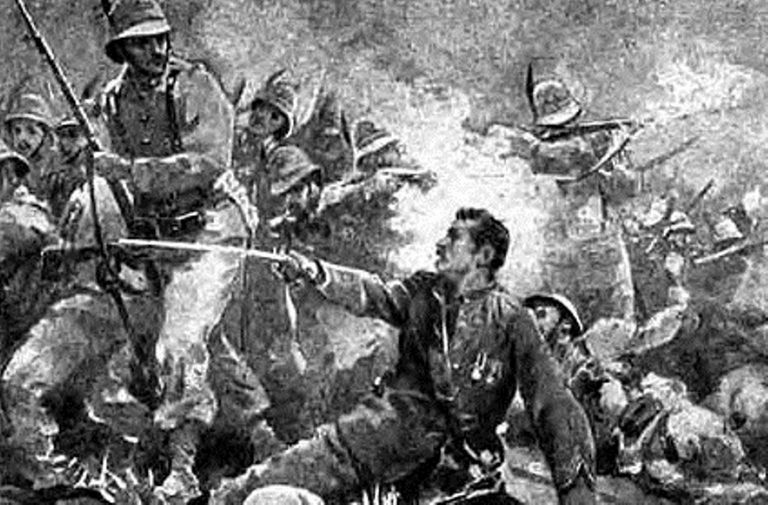 Attacking in waves, the Ethiopians suffered horrific casualties as Italians doggedly defended their lines. Around 10:15 AM, Arimondi's left began to crumble. Seeing no other option, Baratieri ordered a retreat from Mouth Bellah. Unable to maintain their lines in the face of the enemy, the retreat quickly became a rout. On the Italian right, the wayward Dabormida's brigade was engaging the Ethiopians in the valley of Mariam Shavitu. At 2:00 PM, after four hours of fighting, Dabormida having heard nothing from Baratieri for hours began to openly wonder what happened to the rest of the army. Seeing his position as untenable, Dabormida began conducting an orderly, fighting withdraw along a track to the north. Begrudgingly giving up each yard of earth, his men fought valiantly until Ras Mikail arrived on the field with a large number of Oromo cavalry. Charging through the Italian lines they effectively wiped out Dabormida's brigade, killing the general in the process. The Battle of Adwa cost Baratieri around 5,216 killed, 1,428 wounded, and approximately 2,500 captured. Among the prisoners, 800 Tigrean askari were subjected to the punishment of having their right hands and left feet amputated for disloyalty. In addition, over 11,000 rifles and most of the Italian's heavy equipment was lost and captured by Menelik's forces. Ethiopian forces suffered approximately 7,000 killed and 10,000 wounded in the battle. In the wake of his victory, Menelik elected not to drive the Italians out of Eritrea, preferring instead to limit his demands to the abrogation of the unfair 1889 Treaty of Wuchale, Article 17 of which had led to the conflict. As a result of the Battle of Adwa, the Italians entered into negotiations with Menelik which resulted in the Treaty of Addis Ababa. Ending the war, the treaty saw Italy recognize Ethiopia as an independent state and clarified the border with Eritrea. What Happened at the Battle of Richmond?